Structured wine with good hints of fruit and soft tannins and intense. Spiced with a hint of wood, soft in the mouth. 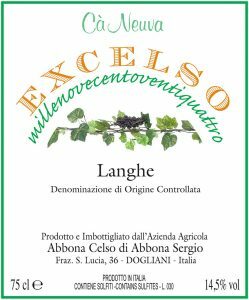 Right balance between acidity and alcohol; with a good predisposition to aging. Bouquet: ethereal wine, very intense, with enveloping hints of vanilla. Taste: velvety, soft, enveloping and persistent. Method: Fermentation with the skins medium-long in steel tanks. Refining the next six months in wood.